Much has changed in the watch world since we launched Mk II. Vintage watches that used to go for entry level prices are fetching shocking prices, materials continue to change and evolve, and the word “homage” has become somewhat confusing. Homage is an important word to Mk II and is core to our brand and approach. But with a variety of interpretations or misrepresentations of homage existing in the watch industry we felt it was time we laid out exactly what homage means to us and how that guides Mk II. A point of constant confusion with watches and their design is how patents and copyrights apply to them. Both patents and copyrights are intended to reward the development/creation of an idea by providing a period of exclusivity that eventually expires so as to incentivize ongoing innovation/progress. As functional items the work that Mk II (and the watch industry at large) does relates to design patents and not to copyrights. Functional designs and technologies in watches can be patented and thus protected, but the aesthetic design of watches cannot be protected by copyright. In many ways the intellectual property aspects of watch design is more analogous to clothing than it is to art. That being said even art becomes public domain eventually. Admittedly this creates a confusingly gray world for watches and their design. To navigate this gray world of watches we’ve always had a strong position on how we approach product design. We feel anybody can make look alike copies. Were all that we felt Mk II could be, we never would have started the company and began producing our own pieces. We have always aspired to pay homage to historical references, and do so by creating a new chapter in their story. Our very name alludes to this, Mk II meaning Mark 2 or the second version of something (usually in a military context). This drive to evolve these timepieces and create their Mark 2.0 came about because we wanted to wear the vintage designs from years past as intended. But they’d either become far too valuable or time had made them too fragile. We saw this as an opportunity to carry on the original ethos by approaching them from the perspective of if it were made today with the advantages in technology, materials, and design best practices what would the piece look and function like? You can’t Homage a design that is less than 15 years old. This is why we aren’t working in ceramic nor interested in working with new designs. Why 15 years? This is the standard protection applied to a design patent. If we feel the watch is new or does something novel we will observe this rule even if patent protection hasn’t been granted or applied for. The functionality of the watch must be comparable, if not better, than the original. The original designs were intended to functional tools, not just look a certain way. So, we spend a lot of time and resources making our interpretations more reliable, serviceable, and functional. 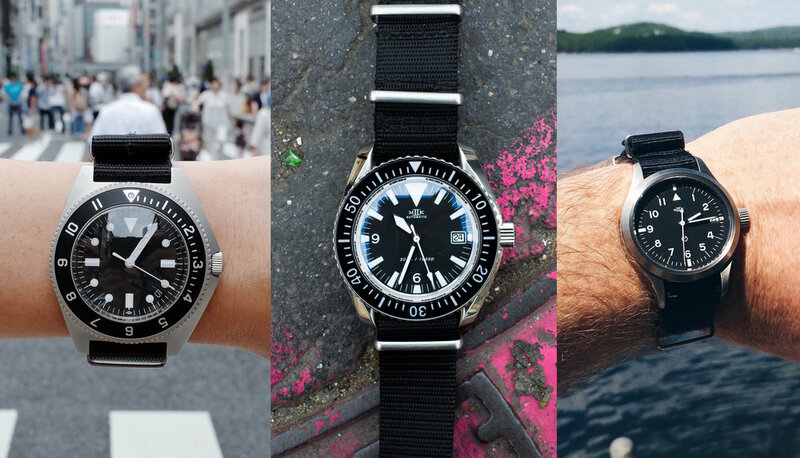 Ideally an homage watch should add to the story of the reference design. It should not be simply pretending to be something that it is not. If it makes sense we will add something of ourselves to our interpretation. This almost always is required when we need to make changes to incorporate modern methods, materials or components. The reality is you have to learn a lot before you can move a historical design forward. If you do not learn something from the design process you are just copying the design, you aren’t creating an homage. You have to be respectful of intellectual property. Because of how watch design relates to design patents and not copyrights as a result of them being a functional item, this area is rather gray. We always err on the side of respect and caution, which help inform all our rules. Ultimately when we’ve gone through the process and adhered to our homage rules, the Mk II pieces that we create when laid next to their inspirational references should look like cousins, and never twins. The irony is that when executed correctly it should appear as an effortless and organic continuation and often the extensive design work and refinement that’s gone into it goes largely unnoticed. In some upcoming posts we’ll take a deeper look at some of that design work to show how our homage perspective gets brought to life.